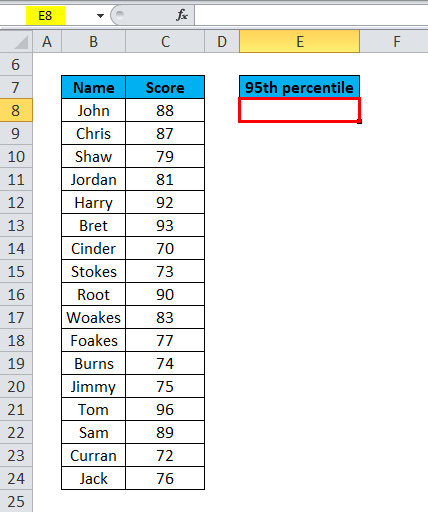 PERCENTILE in Excel (Formula, Examples) | How to Use PERCENTILE? 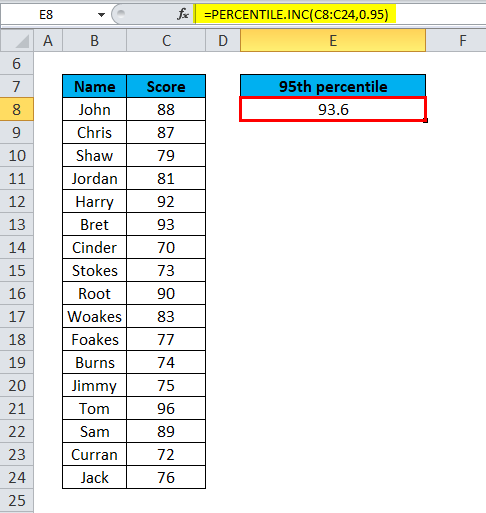 How to Use PERCENTILE Function in Excel? 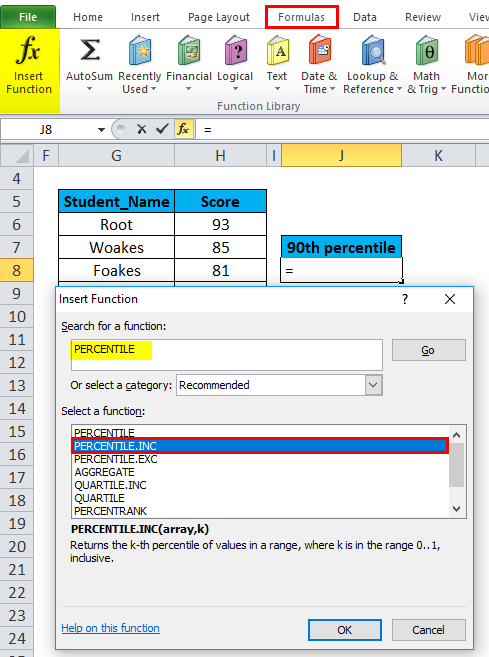 From excel 2010 onwards, Percentile function is replaced by PERCENTILE.EXC and PERCENTILE.INC function. 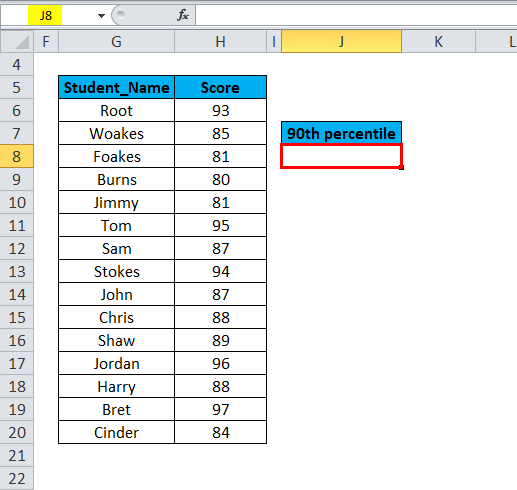 Excel Percentile function is used to report scores in exams or tests, like GRE, GMAT and other entrance exams. Array (Compulsory or required argument): The array of data values for which you want to calculate the Kth percentile. PERCENTILE.INC (INC is inclusive): means the value of k is within the range 0 to 1 Inclusive, When the value of K, is in the range of zero to one you will get a result. PERCENTILE.EXC (EXC is exclusive): The value of k is within the range 0 to 1 exclusive. 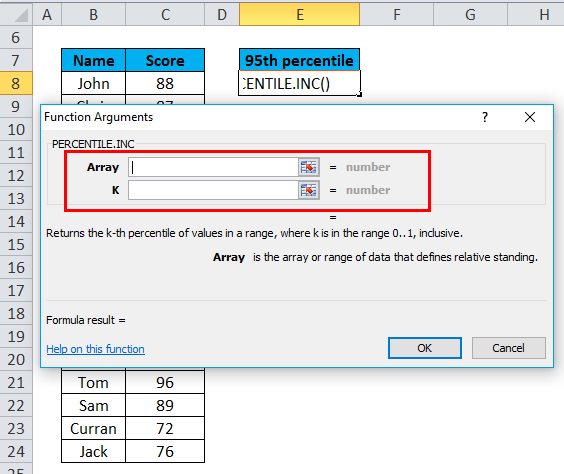 An Error occurs if you use a value of K which is outside the valid range for the data set. PERCENTILE Function is very simple to use. 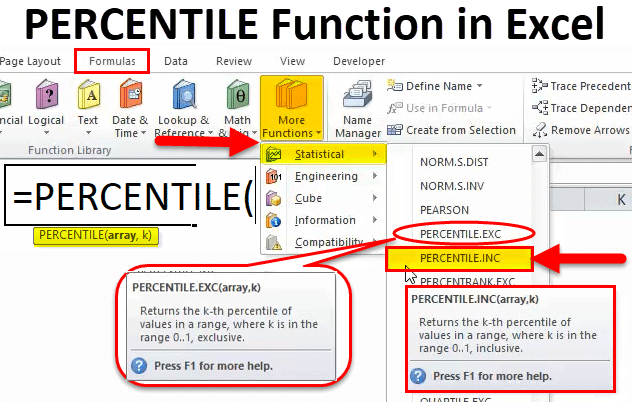 Let us now see how to use PERCENTILE function in Excel with the help of some examples. Let’s apply PERCENTILE function in cell “E8”. Select the cell “E8”. where PERCENTILE function needs to be applied. 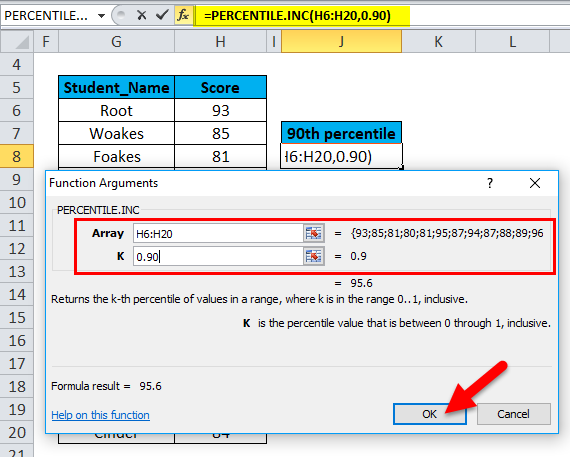 Click the insert function button (fx) under formula toolbar, the dialog box will appear, Type the keyword “PERCENTILE” in the search for a function box, PERCENTILE function will appear in select a function box. Three options appear in select a function box i.e. PERCENTILE, PERCENTILE.EXC and PERCENTILE.INC function. 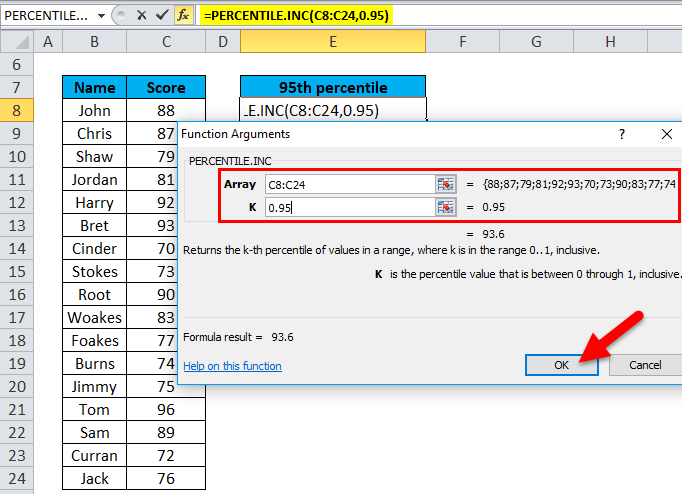 The PERCENTILE function was previously used for excel 2007 & earlier version. 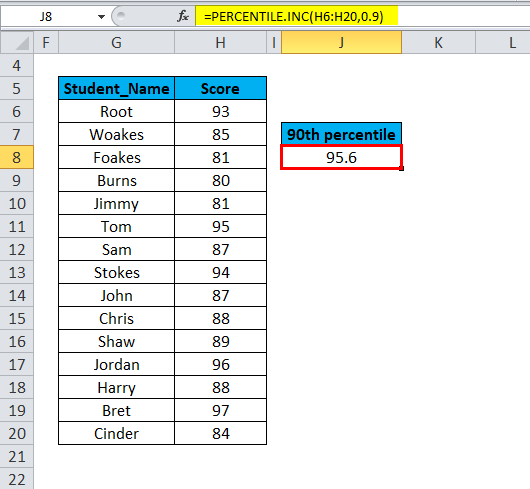 So, you need to select PERCENTILE.INC function. (The value of k is within the range 0 to 1 inclusive). Double click on PERCENTILE.INC. K, it is the percentile value we are looking for. Here I need to find out the value for the 95th percentile, so, I will use “0.95” as percentile value. (K is any percentage expressed as a decimal, i.e. 0.95 for 95%) Click ok.
After entering both the arguments. =PERCENTILE.INC (C8:C24,0.95) i.e. returns the score for the 95th percentile i.e. 93.6 as the result in the cell E8. 95th percentile falls between 93 & 96. 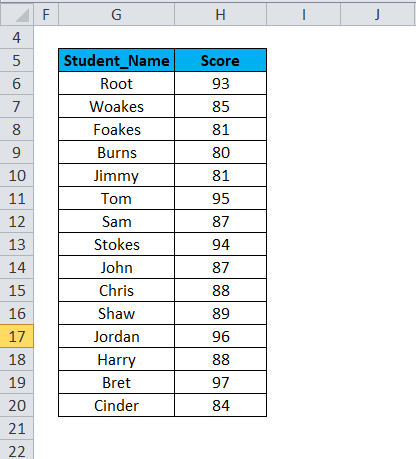 Excel has interpolated between 93 to 96 score, to produce the result 93.6. Let’s apply PERCENTILE.INC function in cell “J8”. Select the cell “J8”. 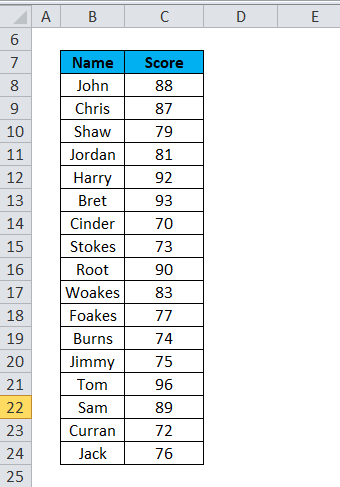 where PERCENTILE. INC function needs to be applied. 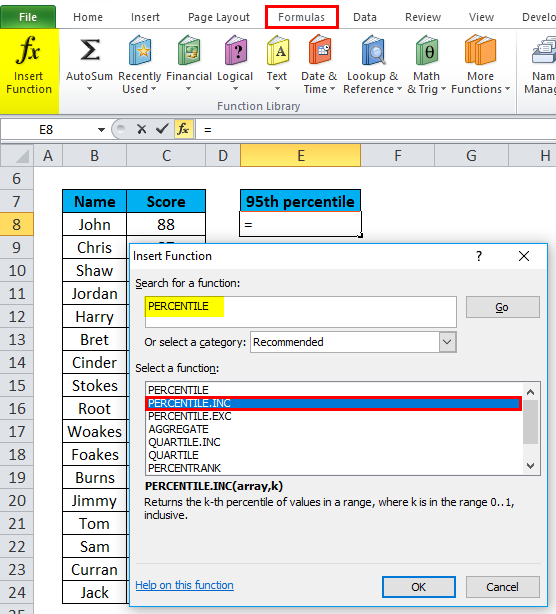 Click the insert function button (fx) under formula toolbar, the dialog box will appear, Type the keyword “PERCENTILE.INC” in the search for a function box, PERCENTILE.INC function will appear to select a function box. Double click on PERCENTILE.INC. K, it is the percentile value we are looking for. Here I need to find out the value for the 90th percentile. So, I will use “0.90” as percentile value. (K is any percentage expressed as a decimal, i.e. 0.90 for 90%) Click ok. 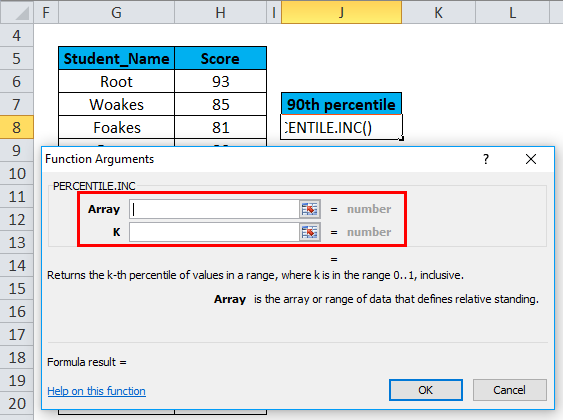 In percentile function, the array argument can also be entered as an individual number in the below-mentioned format. If nth_percentile or k value is not a numeric value (Non-numeric), then PERCENTILE function will return the #VALUE! error. If nth_percentile or k value is less than 0 or greater than 1, then PERCENTILE function will return the #NUM! error.